Hundreds of protesters prepare to confront security forces as Amona evacuation begins. 15 policemen reportedly wounded. Officers from the Yassam unit of the Israel Police arrived in the Amona area early Wednesday morning. They took a position on a nearby hill. Several youths who arrived in the area were preparing to block the entrance to the village. On Tuesday, the IDF ordered the residents to leave their homes within a day and locals estimated that the eviction could start as soon as 6:00 a.m. Wednesday morning. Residents of Amona held an assessment of the situation overnight Tuesday, following which they called on the government to implement the draft plan for the town’s relocation. "Unfortunately, the government hastens to destroy Amona in an inexplicable way,” said Avichai Boaron, head of the campaign to save the town. “This afternoon the Supreme Court held a comprehensive hearing on the question of the absentee property draft plan, in which great efforts were invested by all parties, and in particular by the residents. The Court declared that it would announce its ruling as soon as possible. However, at this moment the government instructed the military not to wait for the decision of the Supreme Court and is planning to begin the evacuation of Amona at 6:00 in the morning contrary to all logic,” he added. "The residents of Amona agreed last month to the absentee property draft, with the Prime Minister and Minister of Education promising to do everything in their power to maintain it. The state decided to kick this plan just before its implementation and again violate the agreement it reached with the residents and create unnecessary tension and evictions. We call on the political echelon: Calm down. Respect the agreement. Let the court decide. Amona will not fall again,” declared Boaron. 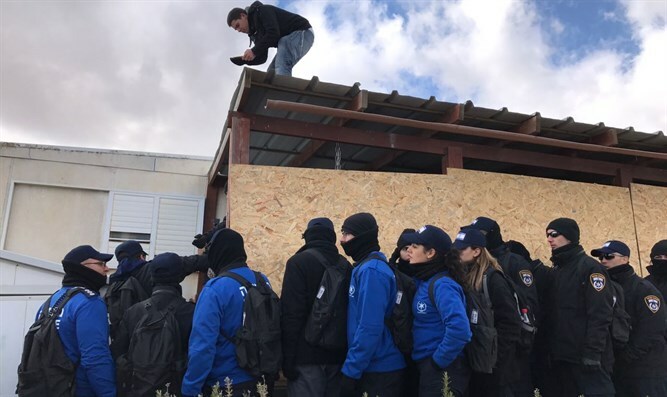 MK Shuli Mualem-Refaeli (Jewish Home), who has been at Amona since the early hours of Tuesday evening and met with residents, said efforts were ongoing to prevent the eviction. "The Supreme Court has not yet had its say in relation to the draft plan and the state is going to evict at first light. We are making efforts to delay the eviction until a decision is made by the Court. We worked hard on the draft plan in order to keep the residents on the hill and we must not give up," she said. As part of a compromise agreement worked out by Education Minister Naftali Bennett (Jewish Home) and Prime Minister Binyamin Netanyahu, the 42 families of Amona were to peacefully evacuate their homes in exchange for two things: one, passage of the Regulation Law, which would protect other Jewish communities from expulsion over ownership claims made years after their construction. In addition, the agreement provided for the relocation of 24 of the 42 families to alternative plots on the same hill where Amona currently stands. New homes and public buildings were promised as part of the deal, as well as a new community for the remaining 18 families, who would be resettled near Shilo. Amona residents voted to accept the agreement, and the Supreme Court granted a delay in the implementation of the evacuation orders, pushing back the demolition from December 25 to no later than February 8. Since the inking of the deal, however, residents say no work has yet been done on the new neighborhood promised under the agreement. Amona residents have nowhere to go.